The godwit doesn’t seem to know or care. Mr. Pinniped was too far away for us to tell for sure that he’s a sea lion rather than a seal, but I think the former is more likely. 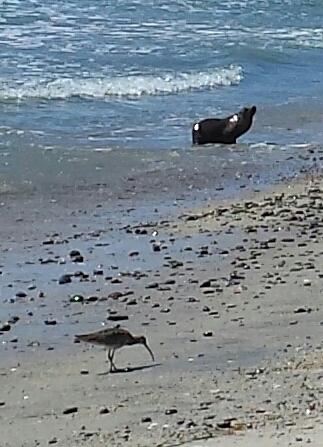 I was in such a hurry to take the photo that I didn’t even realize the godwit was there. Surprise! Unfortunately, as we got closer, the sea lion turned tail, as it were, and swam out to sea/see. He paralleled the beach for a while and then we lost him in a big wave. Where his family was we don’t know. It was much sunnier and warmer this afternoon, which meant more people on the beach. A few others were treated to the sight of Mr. P. After the appearance of Harold yesterday, I guess I wasn’t all that surprised to see Mr. P. today.